Do you ever feel like you’ve taken on too much and you’re scrambling to fulfill all of your commitments? Do you ever battle with feelings of scarcity? Are you convinced that there’s not enough time, not enough resources, not enough talent, or you’re simply not enough? Have you ever felt like you’re trying to do everything and in turn accomplishing nothing? If so – first of all – know that you’re in good company; I’ve been there, too. And let’s face it; it’s rough. But here’s the good news; you can start pulling yourself out of that rut today with the important strategy of self-reflection. 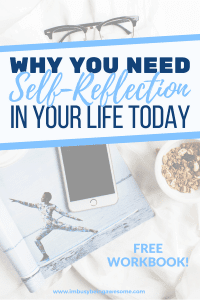 So if you’re ready to increase your happiness, boost your success, and rediscover your joy, keep reading to learn the 3 reasons why you need self-reflection in your life. When is the last time you stopped to truly reflect on how you’re feeling? Can you remember when you spent time focusing on your thoughts and emotions instead of chasing them away with your Facebook feed, a podcast, or a Netflix binge? Don’t worry, if it’s been a while, you’re not alone. Most of us feel we are too busy to slow down and spend time with ourselves. We fill our schedules so full of meetings, projects, and events, that we forget to leave time for self-reflection. And admittedly, it’s often easier to keep those feelings at bay. But here’s the deal, you can learn so much about yourself by taking a few minutes each day to reflect on where you are. Think about the choices you’ve made, both positive and negative, and then consider your emotional response to these decisions. Why did you respond to the different situations in the way that you did? How did you feel after responding that way? Would respond differently next time? When you take those few valuable minutes to understand yourself, and you recognize both your moments of strength and weakness, you prepare yourself to make better decisions going forward. You increase your awareness of your “gut response,” and you begin listening to what you need to feel fulfilled. 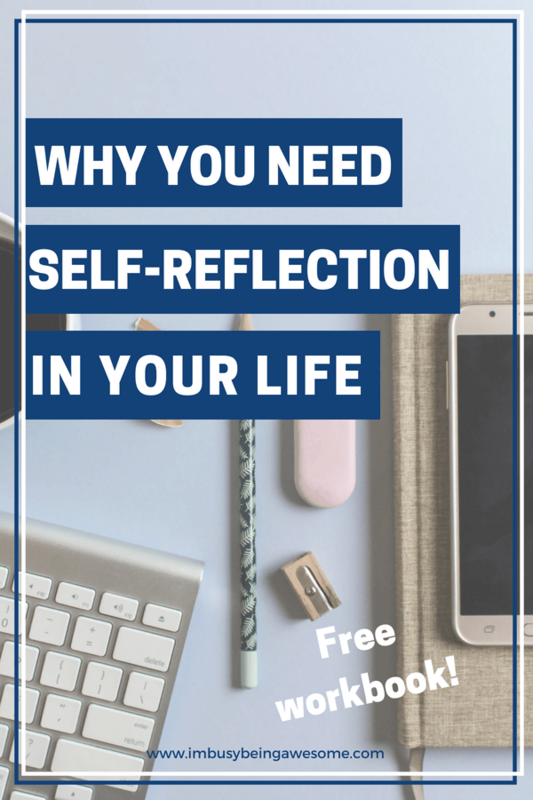 Be sure to download this FREE self-reflection workbook, which guides you through questions to better understand yourself and your situation. Though not always the most enjoyable activity, taking time to look at your past and consider some of the mistakes you’ve made helps highlight recurring patterns and behaviors. In fact, you might notice that the most memorable obstacles often have a similar theme. Perhaps you spent more money than you could afford. Maybe you overcommitted yourself to too many projects, and you couldn’t keep up. Maybe you got involved with someone you shouldn’t, or you made poor decisions to get away from stressful situations. Here is the hard truth: if you don’t take the time for self-reflection, and you don’t learn from these mistakes, you often end up repeating them. By pausing, however, and reflecting upon your triggers, decisions, and emotions, you can better understand what led you down a particular path. That way, when a similar event unfolds again, you can shift that response to something more positive. On the flipside, reviewing past positive events can also help you identify what works, which allows you to keep repeating those actions for continued success. One of the most memorable experiences I have learning from my past revolves around the practice of saying “no.” Like many of us, I am a people pleaser. If someone makes a request or needs a favor, it’s my gut response to say “yes” without considering the consequences. I’d love to tell you that I listened to his wisdom and everything was smooth sailing after that. Unfortunately, I didn’t fully understand the power of his message until much later in life. In fact, it wasn’t until I reached complete burnout in the fall of 2017 that I finally learned from my past and began saying “no” more often. So, if you too find yourself repeating similar mistakes, then take some time for self-reflection. Ask yourself what works and what doesn’t, and begin shifting your actions toward the things that bring you success. Want to learn more about saying no with confidence? Check out my post Increase Your Productivity By Saying No. Many of us are action oriented. We don’t like “wasting” time overanalyzing our decisions, and we take pride in diving in head first. While this can be an incredibly effective approach to getting tasks accomplished, there are also times that additional thought and strategy would benefit the situation. By taking a few minutes for self-reflection, you’ll believe in your decision with confidence; you’ll know it’s the right move for you. By practicing self-reflection and contemplation, you’re finding ways to leverage your strengths, minimize your weaknesses, and set yourself up for future success. What more could you ask for? 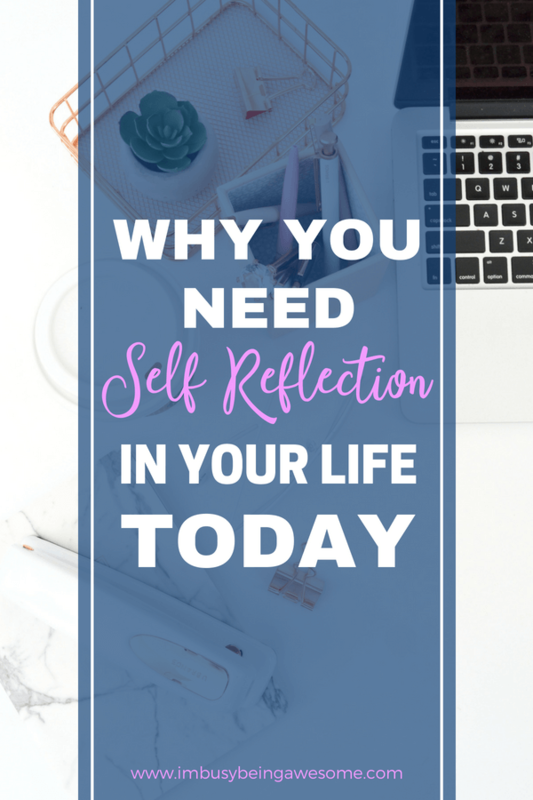 Do you need additional guidance to dive deep into self-reflection? Good news! I have you covered. 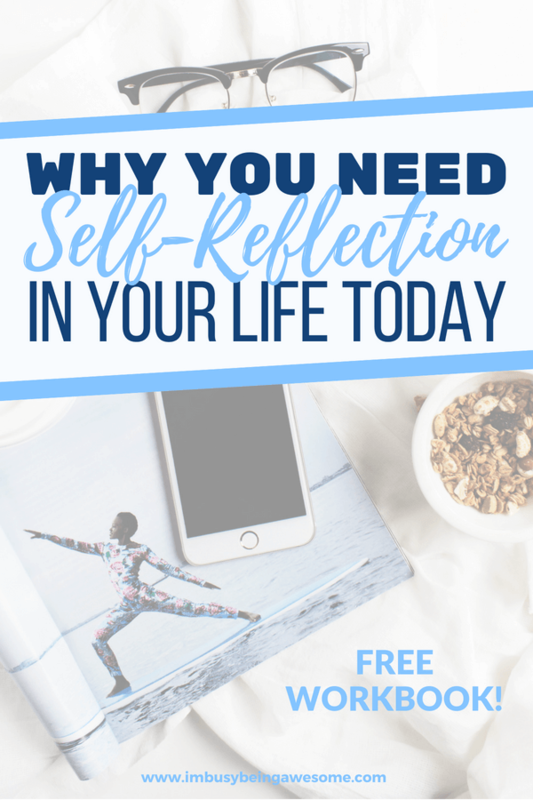 Grab my 6-step self-reflection workbook here, and start living your best life today! Do you practice self-reflection? What have you learned from your past experiences? Which of these strategies speaks to you? Let me know below! I love this post! I try to not look at my past, it like looking in the rear-view mirror of a car glancing is okay but, but if you keep looking you might miss what is front of you! Thank you for sharing! This definitely takes time to learn but it’s so important! When I look back there are so many times I should have taken someone’s advice; just like you and your wind ensemble director! Exactly! There are so many opportunities to learn, aren’t there? This is great. I love your perspective! I love that wisdom from your teacher! We do need to be careful and mindful of the things we agree to take on. I’m a big fan of journaling and self-reflection. I’m a bit inconsistent, but I find it so valuable when I do make the time to reflect. Thanks, Meg! His advice has stuck with me for a long time. Taking time for self-reflection can really make a difference, can’t it? I agree! It sounds like a little thing, but I realized that I was saying sorry too much for little things like being in someone’s way in an aisle. Upon reflection, I decided to say excuse me instead. It is a small change that will make a difference for me. ALL THE YES! I totally needed this today, thank you! The best advice I was ever given has been this: “You can be mediocre at lots of things, or excellent at few things.” I try to choose the latter. From my past I’ve learned that the past is the past…it’s as easy as that! That’s such a great mindset! Admittedly, I still find myself dwelling on the past every now and again. But as I get better at leaving the past behind me, I’ve found it SO helpful to use it as a guidepost to learn, move forward, and leave previous mistakes behind. I am going through a self reflection phase right now. Its time to simplify, restructure and organize. To be effective towards that end I really need to reflect on what it is I really want. I love this! My first career involved lots of self reflections and I’ve noticed that has carried on throughout my life decisions since then. Thank you for the reminder. This is a really thought-provoking post. Love it! Learning from our past is a great part of self reflection. Thanks for the insight! Self-reflection is such a discipline for me – I have to be intentional about turning down the noise and making myself just think thoughts without stimulation. But the best ideas come in those margins, don’t they? Self-reflection is so important to figuring out who you are and therefore what you want and what you need. So many of us skip this important time because we’re busy, but it’s vital! Yes! Exactly, Catherine:) It’s absolutely key! When I think about where I was 2 years ago and then look where I am today, I feel a lot of peace. But I also dont feel that way without the reflection. Thanks for the reminder. Happy Monday! I’m so glad to hear that reflection helps bring that sense of peace. It’s such a powerful strategy, isn’t it? Loved this post!!! Learning from the past is one I’ve been practicing a lot. It’s important to learn from past mistakes and not repeat them…allthough a mistake repeated more than once is actually a decision, hence the importance o past reflection and making better decisions. Thank you, Andrea! And I LOVE how you put that: “a mistake repeated more than once is actually a decision.” You are spot on.